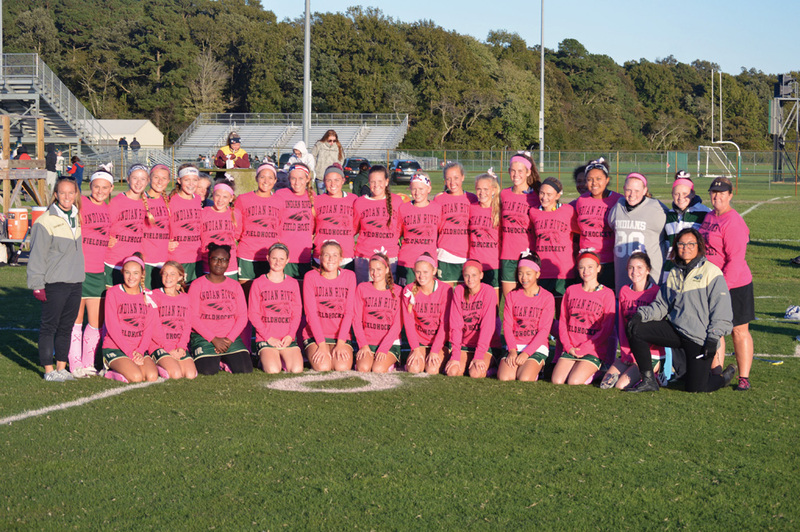 Members of the Indian River field hockey team are sporting their pink shirts after last week’s Stick It To Cancer Pink Game against Milford, which the Indians won, 4-0. 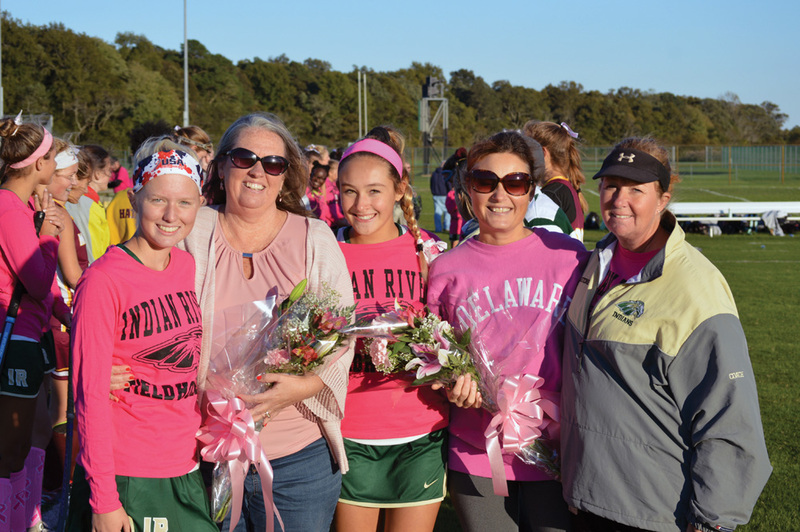 The team honored two women during last week’s Stick It To Cancer Pink Game against Milford. Pictured (from left to right) is Drew Szlasa, Cindy Szlasa, Emma Barthelmess, Danielle Barthelmess, and head coach Jodi Stone. IR won the game 4-0 over the Buccaneers. IR posted scores of 26-31 over Lake Forest and 25-30 over Milford. Senior Patrick Spencer led a trio of Indians that finished 2-3-4 in the race. Spencer’s time of 17:58 was a team-best. Freshman Declan Burke finished the 3.1-mile course in 18:47, which was good for third place. Junior Cristian Galindo followed just :06 later for fourth place. The Indians also received Top 15 finishes from sophomores Robert Senseny (19:20 — 13th) and Colin Hudson (19:38 — 14th). The wins evened IR’s record to 4-4 on the season. They traveled to Cape Henlopen on Wednesday, Oct. 24, for a quad-meet with the Vikings, Smyrna, and Sussex Central. Results from the race can be found on our Facebook page once we receive them. On the girls’ side of things, IR was bested by Milford (18-43) and Lake Forest (21-36). The losses dropped their season mark to 2-6. Senior Sarah Roehl led the Indians with a fourth place finish covering the course in 22:40. That time was just over two minutes behind the winner of the race Josephine Ledford of Lake Forest. The Indians rolled out the pink carpet so to speak last Thursday, Oct. 18, in their annual “Stick It To Cancer” pink game against visiting Milford. The team honored two moms of players on their team following their 4-0 win over the Buccaneers. Cindy Szlasa and Danielle Barthelmess were joined in the ceremony by their daughters Drew and Emma, respectively, along with IR head coach Jodi Stone, and the rest of the coaching staff and team. Avery Congleton did her part scoring a pair of goals and assisting on another — all in the second half. Jess Rybicki scored unassisted to get the Indians on the board in the first half. Freshman Brynn McCabe scored her third goal of the season in the second half sandwiched around the two from Congleton. Sophomore Allyson Clark faced just two shots from the Bucs, and made both saves to pick up another shutout win. In the Tuesday, Oct. 23, setback to Sussex Tech, the Indians were just never able to break through on the Ravens’ defense. IR managed 12 shots in the contest, and worked their way to five penalty corners chances. Clark made six saves in the loss while facing 12 shots. The Indians’ record now sits at 7-5 with three games remaining on the schedule — two of which are home. They will likely need at least one win to have a chance at a berth in the state playoffs, which are scheduled to tentatively begin Nov. 6.